When we last left off our first part of our Inlays For Wooden Wedding Rings, we were taking a look at Lapus Lazuli inlays. Now, we move on to the latter half of the alphabet and dive right into the following beautiful materials: Malachite, Meteorite, Mother Of Pearl, Opal, Ruby, Seaglass, Topaz, and Turquoise. So, without further adieux, let’s take a look! Malachite is a stunning mineral that attains its beauty from the weathering of copper. This aesthetically pleasing inlay is typically bright green with varying degrees of richly shaded green undertones which give malachite it’s amazing dimension. Malachite is opaque but what it lacks in shimmer and shine it makes up for in stunning multi-dimensional coloring. 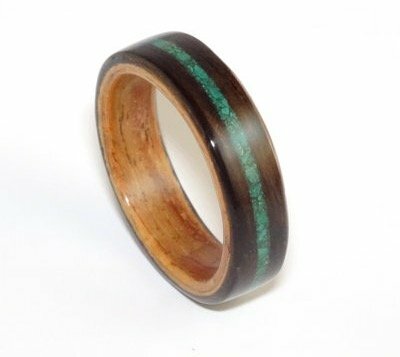 While there aren’t any woods that we believe malachite would look bad with, we love the way malachite and padauk compliment one another, as with this little find over on Etsy. 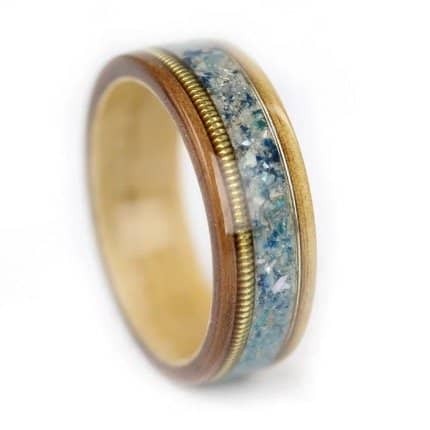 Meteorite in the sense of wooden ring inlays is exactly what you’d expect it to be – space debris. Meteorite serves as a perfect material for an inlay due to its unique and bold patterns. It is important to note that there is a difference between meteors and meteorite. While meteors are space debris that have been witnessed passing into the earth’s galaxy, meteorite are meteors that have done so unwitnessed and found. 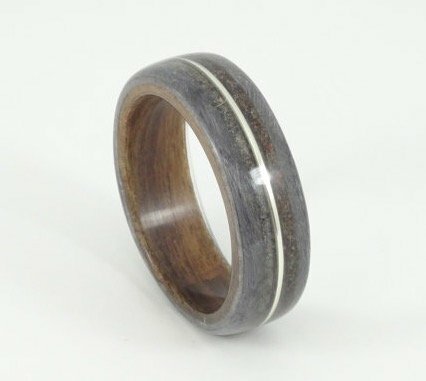 Meteorite varies greatly in color and matches well with a wide array of wooden rings, though we love the way it looks with grey maple! This is a tricky one because oftentimes people see the word Pearl and assume the two to be the same – they aren’t. While the pearl is the circular formation obtained from the inside of a mollusk (to read more about pearls, click here), mother of Pearl is the substance obtained from the inner linings of the mollusks shell. Mother of Pearl is thin but takes up a greater area and, much like a pearl, had an intrinsic shimmer to its opaque color. Ruby is an unmistakable gemstone that comes in a bright pink or red hue. Ruby is actually considered to be a precious stone, putting it in the same category as diamond! While a Ruby must be red, these exemplary stones have captivating undertones in colors that from from orange to blue to purple. 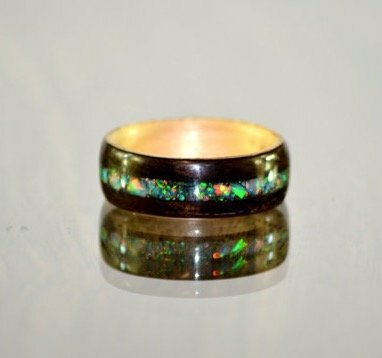 This stunning gemstone is the birthstone of July and makes a perfect inlay for a wooden ring of a bride or groom that were born in that month! Ruby compliments any wood wonderfully, but we love the way it sits against the pink undertones of cherry wood. 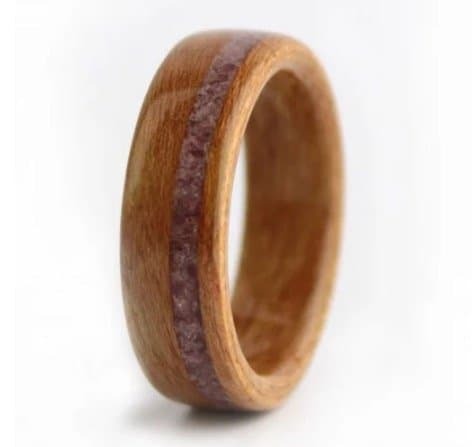 Here’s a great example from over at Simply Wood Rings, which is available to purchase as well. Seaglass is the naturally occurring and stunning result of ocean tumbled glass that forms a frosted effect in its face with beautiful curves replacing the previously shattered edges. Seaglass can take anywhere from twenty to fifty years to reach its level of beauty. Seaglass is often also titled drift glass, but if you come by beach glass, know that it’s difference is that it is artificially produced. 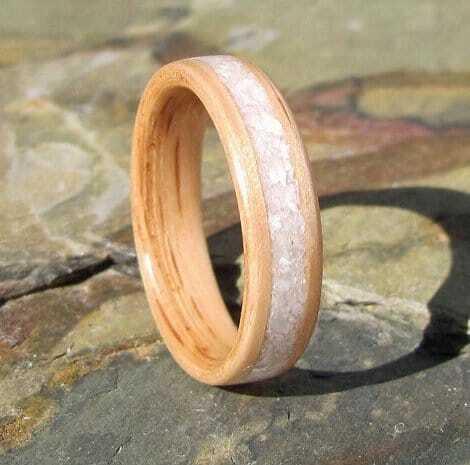 Seaglass is an abundant material that rarely makes its way to inlays but it would be an easily obtainable inlay for a bride or groom willing to try to make their own wooden wedding or engagement ring. Topaz is a gemstone that varies extensively in color, though it is most prominently seen in hues similar to honey. This orange tinted topaz is identified as ‘precious topaz’ and is the most popular form of this gemstone. Another popular color of topaz is light blue – a shade that contrasts harmoniously when paired with ebony. You can find more about this wonderful gem in our extensive directory of gems found here. Have a look at this stunning Topaz inlay ring we found on Etsy. Turquoise is an opaque stone that displays a one of a kind robin’s egg shade of blue. 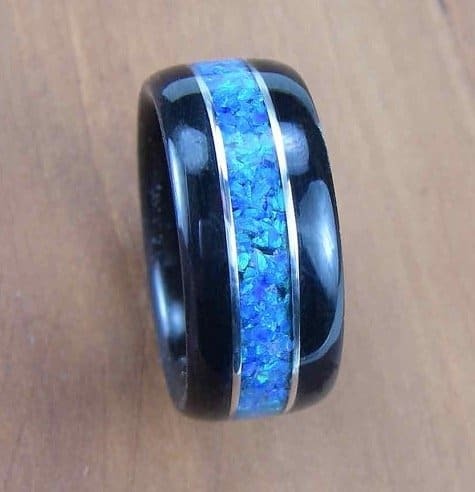 While the most sought after turquoise stones are a solid shade of blue, most have black lines that decorate its shell – these lines are called a matrix and are parts of the rock from which the stone was extracted. Turquoise is a beautiful stone that has no qualm matching up with any wood, though we love the earthiness it exudes when paired with Koa. Have a look at this one from Anniversary And Wedding Rings. There are wide varieties of beautiful stones, minerals, and articles of nature that can be used as inlays! While extensive and full of stunning combinations, our list certainly isn’t exhaustive. 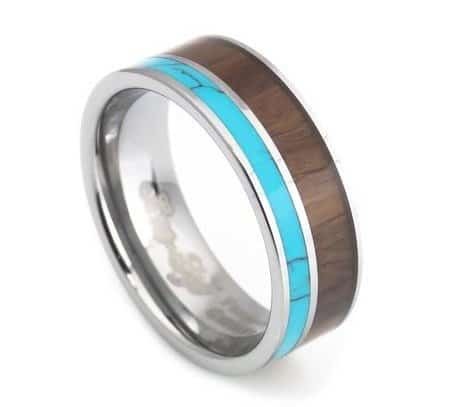 Other popular options for wooden wedding and engagement ring inlays include crushed flowers, crushed seashells, soft metals and other woods! If we missed your favorite wood and inlay combination, let us know in the comment section below and we will pay it the homage it deserves!